I think that other than getting into RC flying stuff after being inspired by my dad, another thing that motivated me is certainly the ability to "see what the plane sees". In other words when I saw those FPV videos on Youtube I was so fascinated that I decided that one day I would get to that point too. And now, after almost two years of fiddling around with planes first, and helis after, I feel I am almost there! Recently I managed to put my hands on a second hand FpvManuals Tricopter kit, built by Tim Nilson in the US but mostly designed by David Windestål in Sweden. 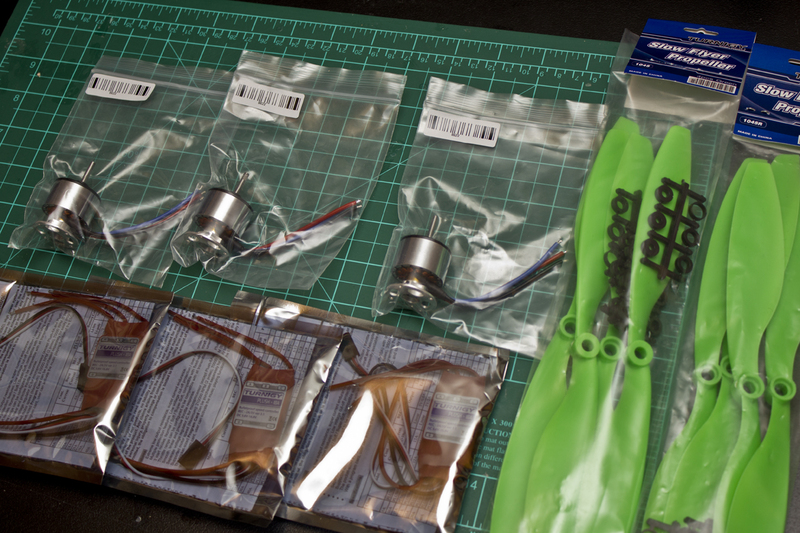 I chose this kit because...well I found it here, second hand, and cheap, its design is brilliant, making for a really good start in the multirotor world. For reference images of the build of the frame itself I will send you to either Tim's or David's build logs, which both described the process in great detail. 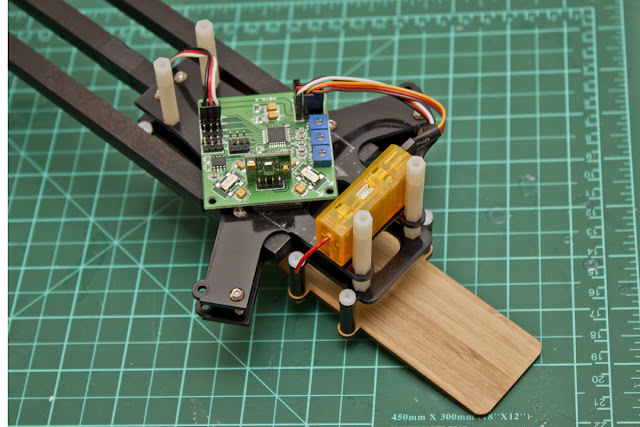 What I want to focus on in this article is how to wire all the electronics, connect the plugs and basically transform an inanimate kit into something that flies...and sees! This is mainly because coming from a plane and heli background I had no idea of how to approach a multi. The picture above shows how I decided to connect it to the receiver, a simple orange 6ch: the board has all the signal pins towards its inside, and it needs to transfer the power coming from the BECs to the rx, to do so only one pair of wires is sufficient. You can see I run a "male to male" servo wire that connects all the signal pins from the rx to the board, and another one which connects the fourth channel and powers the rx. In specific I found it easier to power the throttle, ailerons and elevator channels with a single "male to male" wire, and to connect the rudder one as one would normally do. This is because of the position of these channels on both the board and the rx. The wires that exit the board on the right are going to the rudder servo, and on this particular board it needs to be plugged where the fourth motor of a quad would be. Apparently this is firmware dependent, so please check which version you have and follow the instructions. Once the board and the rx are in place I started prepping the remaining components, pictured above. I am using 3x 18A Turnigy plush ESCs, 3x 2213N 800kv motors and some 1045 propellers, CW and CCW rotating, to keep the tricopter as flat as possible, as I will use a camera on it. 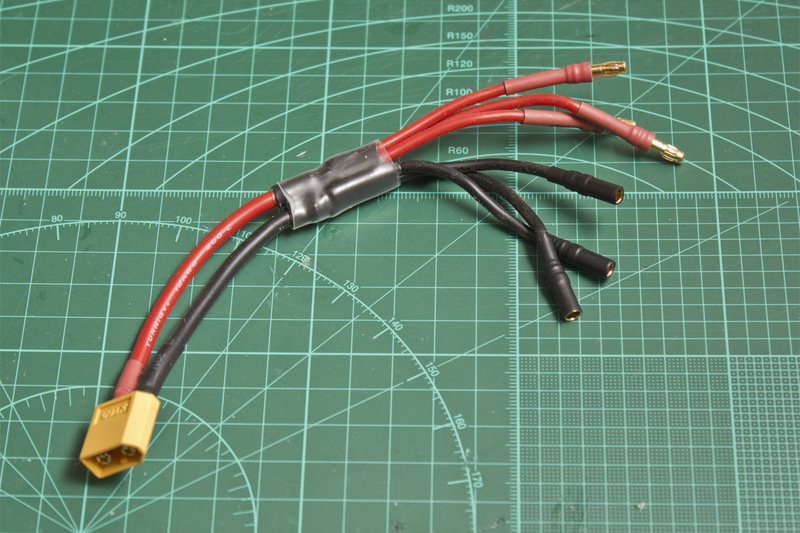 Some find this step dreadful, but I find a special satisfaction in connecting the motors and the ESCs to their bullet connectors. I also made a quick video tutorial describing my way of doing this. The great thing is that with a tricopter I had to do this step three times! I can't wait to build an octocopter now! Above is a picture of the power harness. What this thing does is to split the power from the battery and direct it to the ESCs. In this case three. This is a harness I built myself, but I am pretty sure there are ready made solutions. I although suggest you to build yours because every kit is different, and the lengths will mostly change from one to the other. If you happen to have this particular kit, I used two lengths of 50mm for each the power and the ground (side arms) and a length of 65mm for power and ground going to the central motor. All is then connected to an XT60 plug (my personal favourite) going to the battery. All is done, plug everything in and start setting up the radio. - Balance the motors, as done here (I didn't, and the video proves it). - Balance your propellers, as done here. 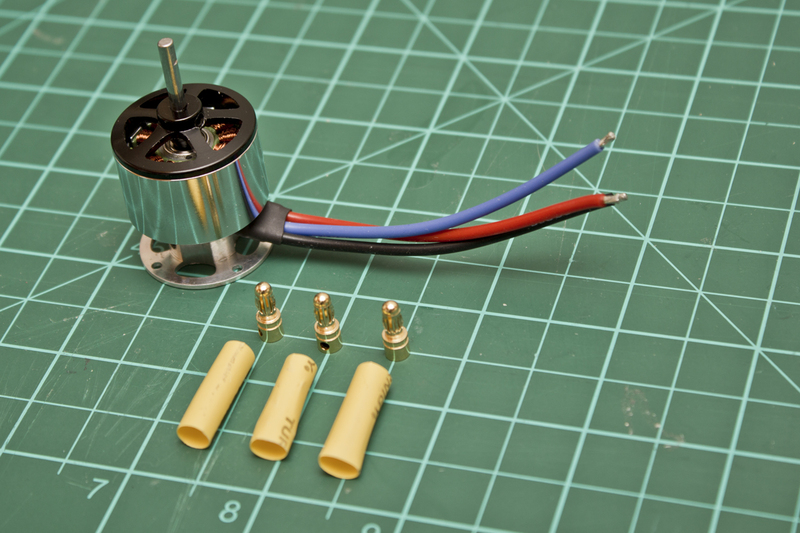 - Make sure your motors spin the proper direction (I am using this diagram). 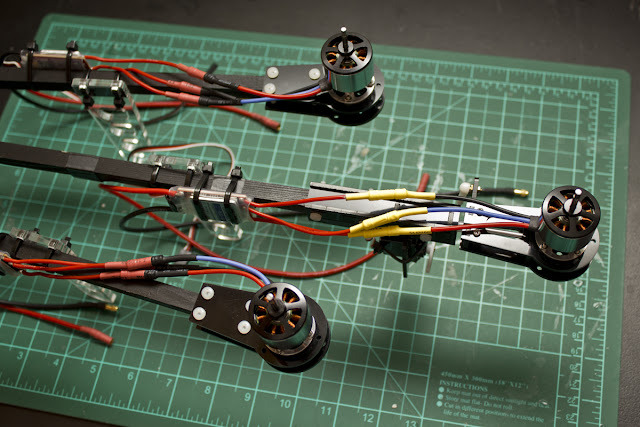 - Program your ESCs before attempt your flight, and set your throttle range for all of them. - Test your gyro direction, in case they correct in the wrong direction reverse them. This is how. - To arm your board plug the battery, and hold your rudder stick to the left until a light appears on the board. - Beware of the propellers. They spin faaaast! 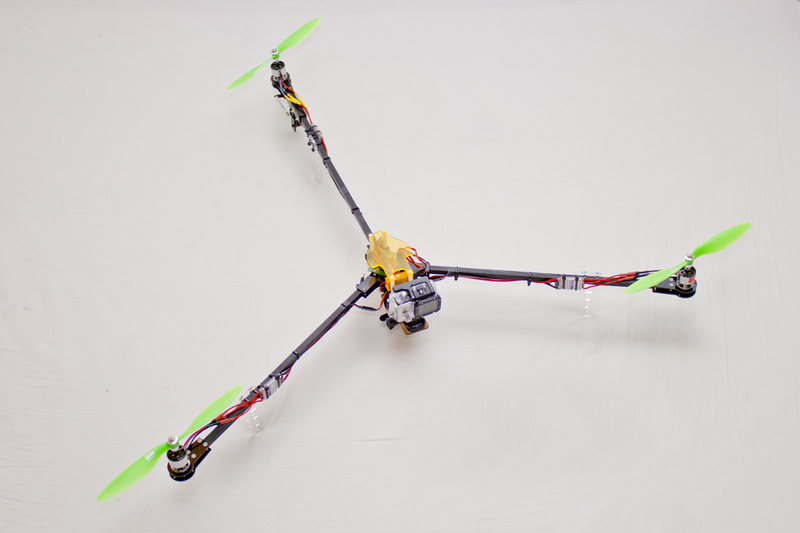 This is a video of the maiden flight, super success! Now, after another while, I went FPV with it! Check the write up here.